Chestnuts. They're not like other nuts. Unlike almonds, peanuts, cashews and so on, chestnuts have a higher water content, are mostly carbohydrates, are low in calories, high in fibre, low in fat and protein, rich in vitamin C and cannot be eaten raw. Think of chestnuts as half way between a grain and a nut. And yes, you can get chestnut flour, and because chestnuts are higher in carbs and fibre than other nuts, chestnut flour works better as a flour replacement than other nut flours. It's also quite sweet, and works wonderfully in dumplings - just swap 1/3 of the flour for chestnut flour and you have gorgeous subtly sweet dumplings in your next stew! But, naturally, it's Nat King Cole that drew me towards chestnuts, and in my efforts to experiment with autumn and winter flavours that don't often grace our home, it was inevitable that they would end up on my list. And what a wonderful versatile thing they are. 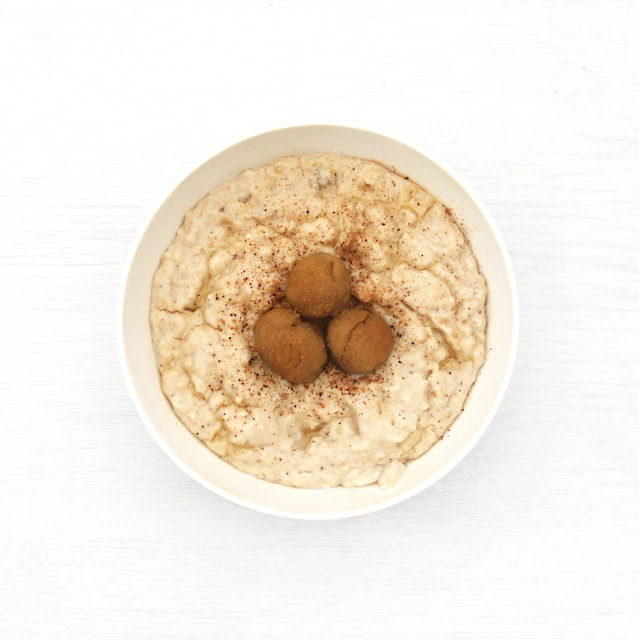 Naturally, being a breakfast enthusiast, the most important meal of the day was my starting point, and chestnuts fit into breakfast perfectly. 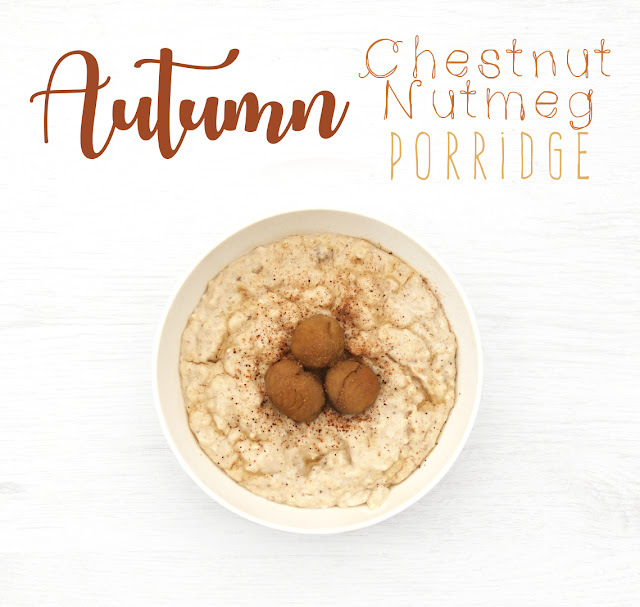 This nutmeg chestnut porridge is a wonderfully simple Christmassy breakfast, and one I'll be repeating a few times when the mornings get colder and the air a little more cinnamony. 1. Combine the oats, nutmeg and protein powder (if using) in a pan, then add the milk and boiling water, stir to combine, and set over a medium, bringing to a boil, then reducing to a simmer on low. 2. Stir in the chestnut puree, and Stevia if using (not the honey), mix it all together thoroughly and leave to thicken a little longer. 3. Remove from the heat and transfer into a bowl. If you're using honey, add it on top (cooking honey kills all the good and beneficial bacterias). 4. Garnish with some roasted chestnuts (I used 3, which came to 25g) and another sprinkle of nutmeg and serve. I prefer to stir the honey through while eating.